Fuseli: a Swiss German romantic, a lover of Shakespeare and the gothic, friend of Blake, a painter of remarkable sensibility and psychological perception, a forerunner of the symbolists. Nightmare, of which he did several versions, was something of an obsession. Perhaps he himself was subject to nightmares: the horrid hairy gnome on the chest, the wide-eyed mare, monsters from the forest, the stuff of Freud and Jung but also of Greek myth and Keats. The gothic revival of Fuseli’s day is with us again – The Da Vinci Code, Templars, shades of black. Fuseli was an extraordinary genius, a man of light and shade not given to understatement, a man educated in the light of reason who painted dark emotions, a Swiss German who lived in England and who fell under the spell of Shakespeare and the Romantic movement. Extraordinarily influential in painting and sculpture from Blake to Canova, Constable and Turner but also in literature from Poe to even Jung who used the painting in “Man and his Symbols”. 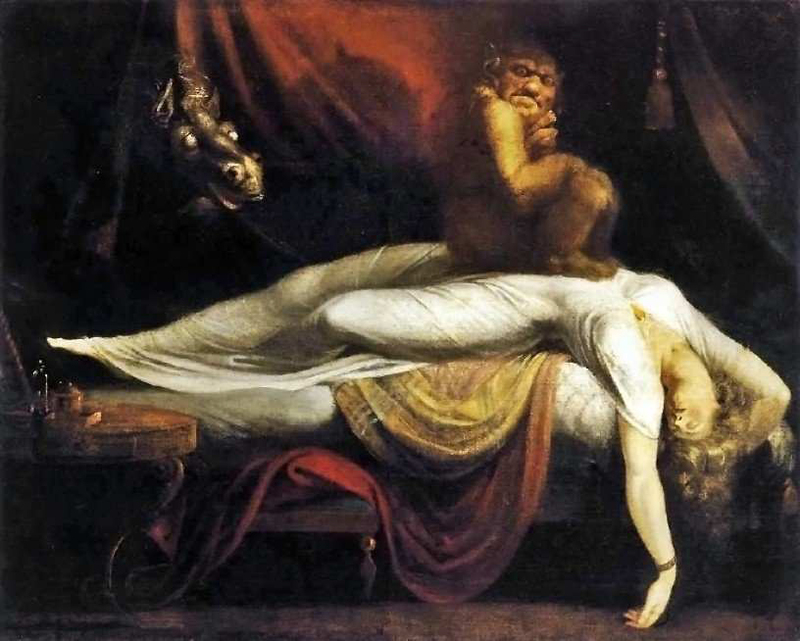 The incubus seated on the chest is common to nightmare stories from Greek mythology onward and is often associated with Pan: there is the suggestion of suffocation, paralysis, sexual violation and of course terror -the essential ingredients of Gothic horror. In Fuseli’s painting, and in my photograph, the nightmare without is a projection of the nightmare within. The powerful feed us sport and trash, but we are the supine audience -it is time to wake up, tune out, and turn off.